Car and bus are the easiest ways to reach Springfield MA, but there are some train and airplane connections also. Located near the junction of the major east-west artery, the Massachusetts Turnpike (Interstate 90), and the major north-south artery along the Connecticut River (Interstate 91), with an active Amtrak train station, Springfield is easily accessible. Springfield is the home of Peter Pan Bus Lines (tel 800-343-9999) a major bus company in New England and indeed the entire northeastern USA. As Peter Pan's hub, it's an important stop on many bus routes, including to Boston and New York City. The Peter Picknelly Transportation Center, also known as Springfield's bus terminal, is at 1776 Main Street (at Frank B Murray Street: map), six short blocks north of Court Square along Main Street, and five blocks north of the Visitor Information office. When renovation and expansion of Springfield's historic Union Station are completed by 2014, it will be the new center of intercity bus traffic, and bus service will move there. Local and regional bus transport is handled by the Pioneer Valley Transit Authority (PVTA, tel 877-779-7882, 413-781-7882). Springfield's Union Station is a block southeast of the bus terminal on Lyman Street, off Main Street. The nearest hotel is only 1000 feet (350 meters) away. The historic station (1926) is undergoing renovation and expansion to make it the city's intermodal transportation hub for trains, and intercity, regional and local buses. Amtrak 's Lake Shore Limited connects Boston, Worcester and Springfield daily with Albany/Rensselaer NY and Chicago IL. The trip between Springfield and Boston takes about 2-1/4 hours. Otherwise, there are daily trains between Springfield, New Haven CT and New York City, and by changing trains at New Haven you can travel between Boston and Springfield in about 4 hours. Unless you have mobility problems, you should be able to walk to just about everything there is to see and do in Springfield, with the possible exception of the Basketball Hall of Fame (about 7/10 mile [1 km] southwest of Court Square), and the probable exception of the Eastern States Exposition (1.7 miles/2.5 km west of Court Square). 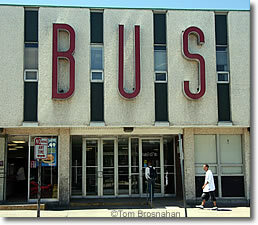 Could this be the Peter Pan bus terminal in Springfield MA?